OSWEGO, NY â€“ Recently, approximately 80 Second Ward residents crowded into the Ponzi Recreation Center at Fort Ontario to discuss problems plaguing the area. The meeting was facilitated by Mike Myers, the ward’s councilor. Oswego Police Lt. Charles Searor and Juvenile Officer Sue Coffey were also on hand to take questions from the residents. The neighbors are concerned with the amount of vandalism, obscene language and all around mischief by some of the youth in the area, Myers said. Dozens of Second Ward residents share their opinions with representatives of the police department as well as their alderman at a neighborhood meeting. At the meeting some residents suggested taking a firm approach to the offending youth; others pointed out kids will be kids and if you respect them, they will respect you. Several of the residents were upset because they feel the police aren’t doing enough to curb the problem. Coffey described the laws regarding juveniles and pointed out that even if a youngster is arrested and goes through the court system, people won’t find out about it because of the confidentiality laws involved. Betty Gray, coordinator of the Oswego Neighborhood Watch Program, suggested residents put a motion light outside of their houses. “It’s sad we have to do this, but it will help to protect you and your property. If your neighbor is looking out for you, you will feel better and this is what the neighborhood watch is all about. Being part of the Neighborhood Watch is all about helping, even if you dislike your neighbor you should do what is right and report any concerns,” she said. Residents should call the police and the police need to have more of a presence in the ward, he said. The alderman said he will use the issues and comments raised at the meeting to plan for another ward gathering. The next meeting, he explained, would be more formal with a panel including himself, the mayor, police chief and others. Speakers would be limited to address the panel one at a time, for 3 to 5 minutes. The Neighborhood Watch Program is something that can help curb many of the problems, he noted. 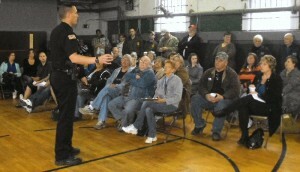 The last neighborhood watch meeting was held in January. About 26 people attended, according to Gray. “There were a few new faces, too,” she said. So far there have been 24 “watch” signs put up by the city’s traffic department, and six more will be put up in the spring. In 2009, 730 stickers were put in windows or doors. “We basically let people know that this is a program that helps the police help them. It’s not sanctioned by the police, it’s not run by the police, it’s headed by the people like Betty who are trying to make this community a better place to live,” Nicholson said. A neighborhood watch can be just one person keeping an eye on their property and being kind enough to look out for their neighbors, too, he added. “Hopefully, it catches on. We have pockets of neighborhood watches all around the city. They’re scattered all over and some of them are as little as just two households,” he said. Gray said she’d like to see the public come to the meetings and ask questions and volunteer. The next meeting is tentatively scheduled for April 20 at the Oswego Public Library, 120 E. Second St., from 6 to 8 p.m. In the first 15 minutes, guest speakers Judy Coe Rapaport and Mary Vanouse will talk about the new Community Development Garden. Following right after will be an open meeting. All city residents are welcome to attend. “The program has expanded and is growing with the help from the community. I would like to thank the people that are using there eyes and ears and calling the police,” Gray said. If schools and the police used the city’s Peer Youth Court program, you’d have a jump on the problem. This program is way under utilized. Tax payers are paying for it. Isn’t the Rec center in that ward? Why aren’t these parents being held accountable. Mandate parenting programs. These problems all stem from the family. Don’t recreate the wheel, use the taxpayer funded programs already being paid for. HOW many of the kids are the off-spring of recent imports to our community? It may seem like a positive solution to many urban areas to have the medicaid bill lowered for the big cities by spreading it out across the state and into smaller communities. With the recently transferred parent who may be disabled (physically or emotionally) comes the child who brings his/her urban idea of life with them. As this has occurred for over a decade (our own county legislators voted to lower the waiting period for out of county social services, making it possible to transfer from Syracuse, Rochester, Buffalo, and even NYC without any wait at all), we are now seeing the ramifications of this RAPID influx of new residents OUR economy and resources cannot support!!! There is no work for these kids, there is little in the way of recreation even if they do have money…what do we THINK they will do with their time? As a community, we have a problem. Some of these kids will figure out that there is money in ‘recreational drugs,’/minor robbery, when there is no money from working twenty hours a week at the burger places. IF they can get a job, since there aren’t many of these jobs for what employers see as the more employable kids. How will a kid without a family support network locate a job? As more residents retire out, and their grand/children leave the area to find a living elsewhere, we can’t help but become a ‘welfare state.’ Sadly. There is nothing much here, and what there is, is ‘taken already.’ New residents have a very hard time finding legal employment, creating an avenue for greater and greater illegal venues. And, as long-time residents who remain bring their children into this ‘urban atmosphere,’ Oswego will become an extension of this urban lifestyle. Goodbye the best kept secret in Central New York (the safety and community we have ENJOYED for generations). So a) contact your legislator(s) and ask them to please slow the importation of new residents to our community, until we figure out how to EFFECTIVELY ($$$) incorporate those we have. b) we need to find state funds to provide resources for these kids (and their adult parents, too!). Make sure you answer your 2010 Census, or quite frankly, we won’t get our fair share of those resources, but other places will. c) get your elected officials to curb unnecessary spending or duplication of expenditures, because this problem won’t go away!